Seashore at the afternoon is my favorite place to visit – even just by myself. The sand, the breeze, the sea, the wind, the waves, the life – everything just sacredly bring about peace within one self. One more reason why I love the sea, because that place where my heart anchored itself long time ago. Above the mortal sand that has long gone, I put my whole feeling – which I ever told nobody. I love since it is the very love itself. 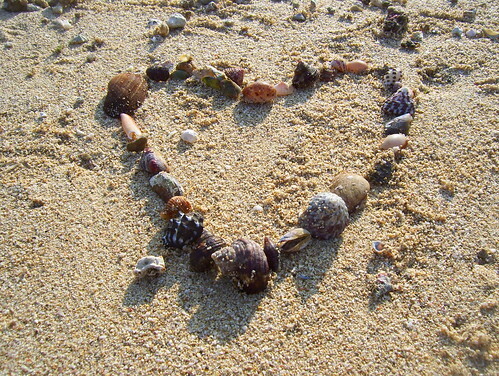 Chained without a chain, free yet it bound amazingly, my feeling – my heart is love above the sand. ye…kmaren diajakin k siung g mau.. ayo ikutan klo aq jalan2…jgn di kamar mulu sih…ntar jd mirip cicak…!! Siung itu di mana lagi, nanti malah tersesat ke ujung dunia :D. Lha, cicak-cicak itu kan para minion-ku, kalau tidak ada bos-nya mereka bisa diburu kucing tetangga :evil:. Biasanya kan pas kecil seperti itu, kalau tidak ke pantai, pasti mintanya ke pegunungan yang berhawa sejuk :). Kalau cendana sulit Pak, carinya mesti NTT 😀 – kejauhan.